Over the last few years, Cartier’s watch releases have been consistently impressive, alternating between savvily commercial and outrageously stunning. This year we saw that strong trend continue. The big news was the addition of a chronograph to last year’s wildly popular new Santos. In addition to complication, this model adds some not insignificant bulk. Deceptively simple and unerringly elegant, this quartz-powered Tonneau is a real looker, and as someone with a fairly large wrist, I was surprised how good it looked on me. This watch is a classic case of why you need to see real-life pictures of a watch (or even better, the actual watch). When I saw the press release renders I was a little underwhelmed. In real life? I was blown away. This simple, slender quartz watch was one of the most pleasant surprises of SIHH, eminently wearable and Cartier design at its most pure. If you’ve ever wanted proof that Cartier is interested in growing its fanbase, this is the watch. 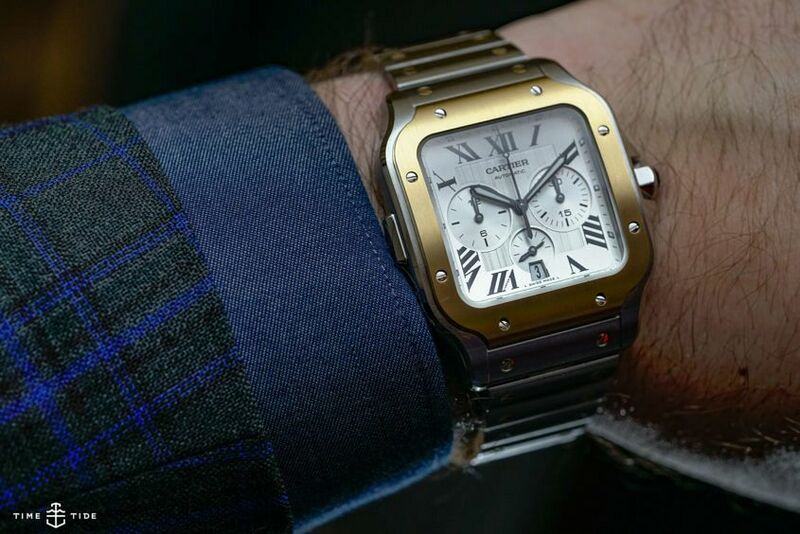 On the one hand, it’s classic Cartier — the skeletonised Santos has been a staple for years. The addition of lumed bridges and a black case transform it into something modern and contemporary. It’s a winner.